With serendipitously perfect timing Sue's long-ago university buddies, Pam and Kathy, flew in from California and North Carolina, respectively, to join us in Bora Bora. They both left behind families and work and got a one-week lesson in living the slow cruising life. 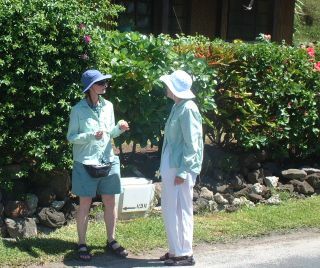 Normally we (on Ocelot) do the write-up of all our activities with our visitors, but Kathy emailed us details of their visit which she and Pam put together on the flight home, and we've put them here on the site, together with some of the photos we all took. Below is a synopsis of our week together, with links to the letters and more photos. The day they arrived Jon and Sue were able to ride the airport ferry across the lagoon to pick them up at the airport, instead of having to wait for them at the dock in the little town. We then hit the local supermarket to fill up on meat (we'd just had 6 weeks of vegetarian visitors) and gave them their first exciting dinghy ride to our anchorage near the pass. Not wanting to waste a minute, we spent the afternoon snorkeling, a first for Kathy. On their first full day we did a beach walk on the motu, then moved Ocelot to the main island near Matira point for more snorkeling. We left Ocelot at the same anchorage and spent the day exploring the shoreline and hotel gardens and arranging for the next day's bicycle ride. The bicycle ride was wonderful, if not a bit long and hot! We topped off that day with watching dances ashore. The next day we moved Ocelot to the eastern side of Bora Bora and had a nice reef walk, but we weren't impressed with the eastern lagoon, so we motor-sailed around to the Bora Bora hotel on Matira point again to catch the dances again. Pam had been to Bora Bora 30 years previously, and had a great time identifying the campsite where her school group hung out, and the Bora Bora Hotel at which she had had her first piña colada. 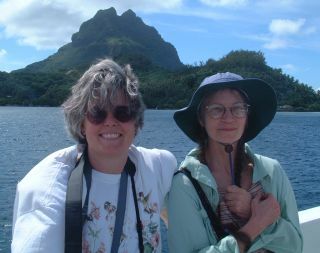 On our second to last day we had a lovely (unusual) west wind, so we decided to make the crossing back to Raiatea where we would put them on the plane on March 26 in the pouring rain. A soggy ending to a fabulous week!